The 3D coordinate system consists of three lines or axes (singular form: axis), which are mutually perpendicular to each other, and form the abstract representation of the three dimensions that we humans are able to see. If we had the ability to sense or see in more than 3 dimensions, we would not be limited to the 3 axis system, though this limitation is absent in areas such as linear algebra where you can describe systems with any number of dimensions in an abstract sense. In real life, we see only in three dimensions, and will be our basis behind creating real life-like game environments and models. The three axes are referred to as the X, Y, and Z axes. 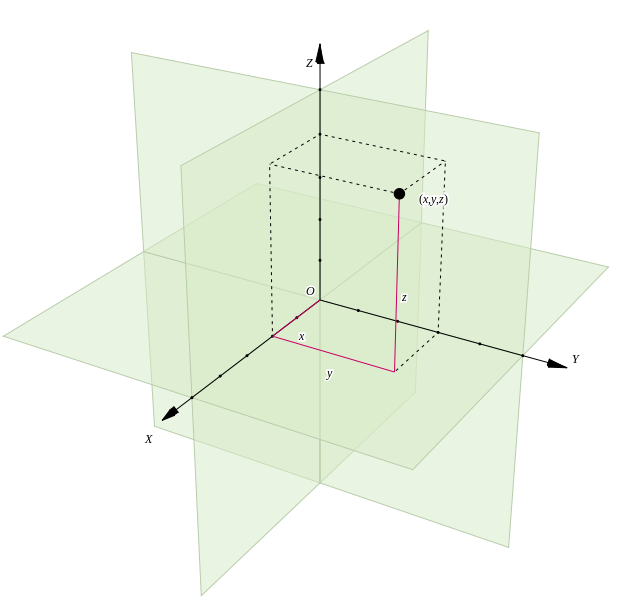 Any and every point in 3D space (relative to the axes) can be described in reference to these three axes. The point where the three axis lines intersect is known as the origin. The origin is to the 3D space, what the number zero is to the number line. A coordinate in 3D space is described by the length units projected on the X, Y, and Z axes respectively to reach that position, starting from the origin. Thus the position of the origin can be described as (0, 0, 0) and the point shown in the coordinate system below has the coordinates (x, y, z). Left handed and right handed orientation is nothing more than a categorization of how the 3D axes can be aligned. If you take your left hand and extend the thumb, index, and third finger at right angles to each other, and hold your hand so that the thumb (positive x-axis) is pointing to your right, the index (positive y-axis) is pointing up, and the third finger (positive z-axis) is pointing towards the direction you are facing, then you have a left handed 3D coordinate system. If we do the same with our right hand, where the thumb, index, and third finger are the positive x, y, and z axes respectively, we have a right handed coordinate system. Notice that if you rotate the right handed orientation to match the x and y axis directions of the left handed system, only the positive z-axis changes direction. We could say that the difference between the orientations is that in a left handed system, the positive z-axis points away from us towards where we are facing, whereas in a right handed orientation, the positive z-axis points towards us. The figure below represents this fact. In the next post, we will learn about multiple (3D) coordinate spaces and nested coordinate space, and also how basic coordinate transformations can take place. Please leave any feedback on content, clarity of writing, on what you think should be changed, or errata in general, and I will do my best to work on it.